The Google I/O Developer conference is set to kick off soon at the Moscone Center San Francisco, allowing Android enthusiasts from all over the world to to come together to improve their coding skills and see Google's latest technologies in action. While Android will more than likely be a highlight at the event, there is great expectation for the unveiling of Android M.
Traditionally, Google has been naming major Android versions after candy and pastries. Android 1.5, for example, was called Cupcake. Then came Donut, Eclair, Froyo, and so on, all the way to Lollipop. 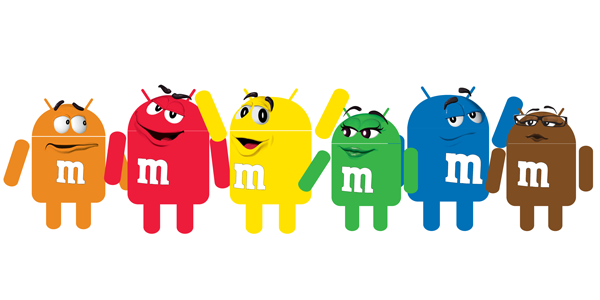 Since Android release names go in alphabetical order, it is safe to assume that the name of the next big Android release will begin with the letter M.
According to speculations, it could be anything from Muffin or Marshmallow to Milky Way or M&M's, should Google choose to partner up with a well-known candy brand like it did for Android 4.4 KitKat. It is said that the upcoming Android release is internally codenamed Macadamia Nut Cookie. Its official name, however, is most likely to be different, hopefully one that rolls of the tongue more easily. In terms of version number, Google may choose to go with Android 5.2 or decide to jump straight onto Android 6.0 for their next dessert. In terms of features, Android M is shaping up as an evolutionary upgrade over Lollipop, not as a revolutionary one. That is, its focus could be on enhancing existing features instead of implementing a ton of new ones. Then there are the things likely to stay rather unchanged, such as the look and feel of Android's stock user interface. Minor tweaks here and there are sure to come, but as a whole, Android's UI is expected to be built on top of the Material Design principles instilled with Android 5.0 Lollipop. In other words, expect seeing more flat icons, shadows under objects, sliding transitions, and minimalist approach to graphics design in Android's next major version. The Android M user interface is rumored to introduce a couple of welcome features – native multi-window support and universal quick replies to incoming messages. The former, which allows apps to run side by side, has been available on some manufacturer UIs for quite a while, and we'll be happy to see it land on a broader range of Android devices. As for the latter, quick replies have been part of iOS since its 8th major release. If Android M's approach follows a similar principle, we'll be allowed to shoot quick text messages back straight from the notification panel. Back in March, Google confirmed that it had been working on a new mobile payments framework called Android Pay. It shouldn't be seen as a whole new mobile payments system as, technically, it isn't going to be. Rather, Android Pay is developed to be a layer allowing devs and companies to easily integrate secure payment methods in their apps. At first, NFC will be the main communications medium used by Android Pay, and biometrics data should be supported at a later point in time. From the looks of it, a new Photos application will be announced alongside Android M. Screenshots of the new app were recently obtained by Android Police, showing off the software's functionality and UI. As before, users will be able to back up their images to the cloud, but the twist now is that images won't be tied with the user's Google+ account. Furthermore, Assistant is the name of a new feature in the Photos app. Its purpose is to let people easily create movies, stories, animation and collages out of their photos and videos. Imagine if you could interact with Android apps using your voice. Well, if rumors are to be trusted, that might be a feature in Android M, allowing developers to add hands-free capabilities to their software. While details are still scarce, this alleged hands-free capability could be just an advanced accessibility feature. Another rumored Android M feature that we know little about is referred to as Nearby. In a nutshell, it is supposed to simplify the discovery of and communication with other Android users. Will this be Google's Answer to Airdrop in iOS? Well, your guess is as good as ours. Furthermore, Android M is expected to bring changes to the UI's notifications and volume control system. Details are, again, little to non-existent, but we're secretly hoping for the plain ol' mute feature to make its return to Android. Not that we think Android's interruptions system is going to be retired, that is. Even though Android M won't really be a major Android release, it will focus on improving the overall platform performance. Among the enhancements we're expecting to see are optimizations in RAM management – apps should be using less of the stuff. Furthermore, Android M is likely to improve on stand-by time by reducing app wake-ups and activity while the device is asleep. Lately, fingerprint scanners have become an industry trend, appearing on more and more premium smartphones, including Android-based phones like the Samsung Galaxy S5, Galaxy Note 4, and Galaxy Alpha. Therefore, rumors suggesting that Android M will boast native support for fingerprint scanners make perfect sense as the feature is only going to grow in popularity. This should allow devs to integrate fingerprint authentication in their apps with ease, regardless of the device's make and model. Besides, logging in on multi-user devices with a scan of a fingerprint seems like a convenient solution. On a related note, Android M is expected to be the most enterprise-friendly version of the OS to date. The new release is rumored to bring "the power of Android to all kinds of workplaces [...] to workers at small business, deskless workers, logistics and warehousing jobs". From the looks of it, Google could be building on top of Android's ability to separate personal and work-related data, which was added with Lollipop. Speaking of security and privacy, rumor has it that Android M will allow users to edit app permissions. In other words, if you don't feel like allowing an app to, let's say, read your Google account information or to view your photo gallery, you should be able to disable the software's access to that data. Even though Android M will very likely be unveiled at the Google I/O Developer Conference, it will only likely debut later this year, alongside new Nexus devices. Both LG and Huawei are rumored to be building new Nexus handsets, and we cant wait to see what both manufacturers bring to the table. Based on last year's trend, an early build of Android M may be released to developers after the conference. Last year it was only the Nexus 5 and Nexus 7 2013 (WiFi) owners who got to sample Android L, before the public release of Lollipop five months later. But in any case, one should expect Nexus and Google Play Edition devices to receive the Android M update first. Flagship smartphones and tablets by Samsung, LG, Sony, HTC, and Motorola should come next in line. More information about the Android M launch date will be posted as we get it.